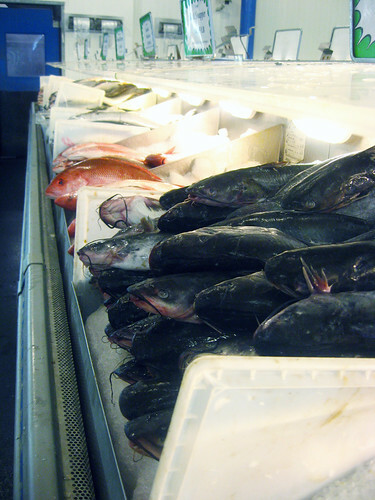 Forkable » Where Can I Find Fresh Fish In Chicago? Hellya: Isaacson & Stein!! We get a lot of seafood sympathy from our seaboard friends for Chicago being landlocked and so far away from the coasts? (Lake Michigan grunts. Sorry Dude, you know what I mean). While its true, you’ll never see lobster for $3.00 lb here, not all the sympathy is warranted. 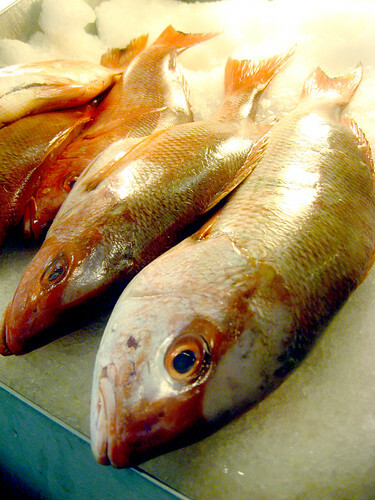 So, is it possible to find fresh, reasonably priced fish in Chicago? Ugh!! Did I hear you say Whole Foods? I’m sorry you’ve been paying so much! No, no no! The answer is Isaacson and Stein’s! This has to be one of my favorite spots in Chicago, which the Yelper, Emily L. rightly describes as “Holy Foodie Heaven!” Isaacson and Stein, a fish wholesaler in the meatpacking district (Fulton off Halsted) which is, as it’s sign reads, OPEN TO THE PUBLIC!! If you’ve never been here, its worth a trip, just to look at the fish! Ohh! Wild Caught Red Snapper! This store’s one big room is a weekly conduit of over 10 reeking tons of the most beautiful fresh fish and seafood in the city. If its good enough for the best restaurants in Chicago, its good enough for me! I’m no snob. Their selection is awesome, ranging from the exotic to local, with rare South American varieties next to locally caught whitefish and perch. Classic seafood options are almost always available, including my favorite fresh muscles, succulent scallops and shrimpies of various sizes. Most of the fish is sold whole, but as the week wears on, you’ll see more and more piles of fillets all cleaned and prepped that day. Whole fish? Don’t worry, after you buy the fish, you can take it over to the two cleaning stands and have one or their amazing mongers gut and clean everything for you, so you get to leave with the freshly cleaned fillets ready for your dinner. 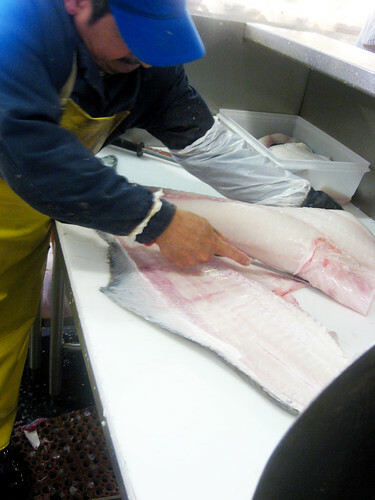 Action shot: Cleaning an Alaskan Halibut! I’d never seen even a partially whole halibut before. This fish is huge and he filleted it in one solid quick motion. These guys really know how to wield a knife! Okay, I know I sound like a paid commercial, but I’m not alone. People freak out about this place. Don’t believe me? Check out their 4 1/2 star yelp page. Ha! Thanks Cat for the great tip! Speaking of tips, check our User’s Guide to Isaacson and Stein so you can make the most of your I&S fishing expedition! Nice post, I'll have to check it out. BTW the link to their page has an extra h in it so it doesn't work. OUTSTANDING. Let's apprentice as fishmongers. I think my son's little league team will be named "the lake trout". Ohh. I like the idea of little league fishy names! What about the Battling Batting Bass or the Terrible Ten Year Old Trouts. Hmm. I'll keep thinking on it. Luckily we have a bit of time to get this figured out. -p.s. Thanks IBerg, I got the link working now!